Crystallography and mineralogy grew up next to each other, mineralogy as the older and crystallography as the younger sister science. Georgius Agricola (1494-1555), in his De Re Metallica, gave instructions for growth of crystals of a number of salts. Crystals and crystal growth were considered and discussed by many natural scientists, with remarkable advances and mistakes on the way. Massive efforts in terms of crystal measurements with optical goniometers, combined with the recognition that the number of point groups for crystals is limited to 32, were intended to discover the reason for the perfect geometric shapes of the crystals. These efforts failed in that respect but crystallography was alive and well even before the discovery of X-rays and the advent of diffraction. At the dawn of structural crystallography, Walther Friedrich, Paul Knipping and Max von Laue carried out the first experiments and developed the theory of X-ray diffraction. From the early days, when even the simpler inorganic structures filled an entire PhD study, structural crystallography evolved at its own pace and found new partners in chemistry, physics, materials science, biology and other fields of physical sciences. Both morphological and structural crystallography, however, have remained as important instruments in the mineralogist's toolbox until today. Efforts to enhance the existing instrumentation, to improve our understanding of the theory of diffraction, to study nanoparticulate or poorly ordered materials, and to master large, complex structures continue in all fields of physical sciences. Mineralogy can thus use the fruits of this labour and include them in its toolbox. In this volume, we did not intend to create a textbook of structural crystallography. There are many excellent examples of such textbooks available. Therefore, there is no chapter on the principles of diffraction (including X-ray diffraction), nor is there a chapter on the practical aspects of structure solution. Instead, we present selected topics on powerful tools that may help us to understand the structures of minerals and synthetic compounds. We did not wish to include a chapter on neutron diffraction, not because this method would not be of interest to mineralogists, but because there is a relatively recent entire volume on neutron diffraction (Reviews in Mineralogy and Geochemistry, volume 63, Neutron Scattering in Earth Sciences). Crystal structures, owing to their periodicity, can be described by fairly simple mathematical models. These models condense the information on positions of moles of atoms in a crystal to bytes or kilobytes of data. The structures and their mathematical representation are therefore excellent subjects for classification, generalization and prediction. In chapter 1 of this volume, Sergey Krivovichev discusses how crystal structures are described, interpreted and classified. He focuses on the structural hierarchies and modularity of the crystal structures. The chapter presents general ideas and concepts on the crystal structures, applicable to all groups of minerals and synthetic compounds. There are many structural classifications of specific groups of minerals available; for some of them, the reader may also consult the first volume of the EMU Notes in Mineralogy (Modular Aspects of Minerals, edited by S. Merlino, 1994) and many other reviews. Powder X-ray diffraction, even though not a new technique, offers the opportunity to investigate samples for which good quality crystals are not available. This is the casefor many mineralogical and geological samples and this 'routine' method should not be omitted from the repertoire of a mineralogist. As the quantitative treatment of powder X-ray diffraction data becomes automated in some applications, one should not forget the need to understand this technique (instead of using it as a black box) and to grasp its potential. In chapter 2, Angela Altomare provides a thorough overview of the advances made in powder X-ray crystallography over recent decades. She shows clearly that powder X­ray diffraction is not only a simple finger-printing method but can be used to solve crystal structures, quantify phase compositions of mixtures, extract structural data at extreme conditions and much more. Precession electron diffraction (PED) allows us to determine crystal structures from very small particles, down to a few nanometers. 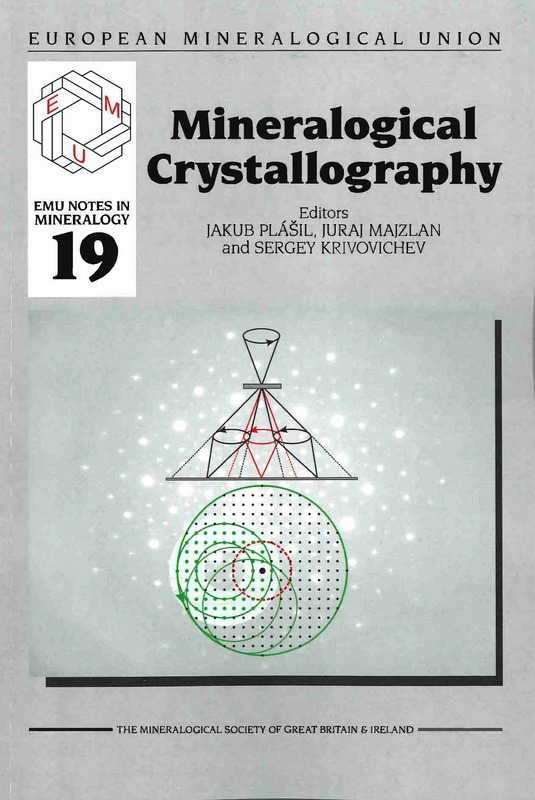 In chapter 3, Lukas Palatinus, Mauro Gemmi and Mariana Klementova explore this method, explain the principles of electron crystallography and related techniques, and give a number of examples, most of them mineralogical in nature. The very small size of the crystals probed, together with the strong interaction between electrons and matter, opens up an entire new field for structural studies on nanocrystalline materials. The door to the paradise where the structures of many fine-grained minerals from the surface of the Earth, but also from rocks (e.g. charoite), is open, but only a few have entered so far. We hope that this chapter will help to overcome this hesitation. Pair distribution function (PDF) analysis is a method that can be used to track structures of poorly ordered materials. In chapter 4, Marc Michel reviews the basics and the application of this method the potential of which has not yet been used to its full extent in mineralogy. Natural materials may be mixtures of several closely or distantly related structures and, therefore, the data may be exceedingly difficult to interpret. On the other hand, many poorly crystalline substances can be synthesized easily in the laboratory under controlled conditions and subjected to PDF analysis. Knowing the structures of poorly crystalline iron, aluminium and manganese oxides can certainly further our understanding of many processes at or near the surface of our planet. Extraction of the structural data from tiny crystals or poorly ordered substances is an end-member the counter-pole of which is the understanding of large, complex or aperiodic structures. In chapter 5, Luca Bindi and Gervais Chapuis explore the world of modulated, composite and quasicrystal structures. The concept of superspace is described and considered. The chapter gives a number of examples of natural substances with such complicated structures, hinting that there may be many more of those and the concept of ideal, three-dimensional crystals may be a restrictive one, even if defects (point, line, plane) are not considered as elements that violate the perfect periodicity. (2017) x + 258 pp. ISBN 978-0903059-5.